Mix together raw ground beef, chicken or turkey. Add in seasonings of choice. An Italian seasoning is tasty in this recipe. Set aside. 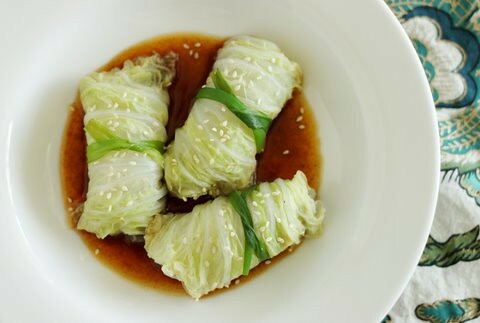 For ease of wrapping cabbage rolls, blanch big cabbage leaves to soften first. Put one cup filler in cabbage leaf and roll up. Place in baking dish, seam side down. Pour tomato sauce over rolls and bake approximately 30 minutes at 350 degrees.